Looking for ingredients to make your scrumptious Swedish delicacies and treats? Here’s my list of where to find them! Due to the enormous protest against iKEA for switching the Swedish brands for their own name brand in the Swede Shop where they sell Swedish grocery items, we have to look elsewhere for Swedish goods. If you’re interested in hearing more about the movement to bring Swedish brands back to IKEA, check out an active Facebook page. Update: IKEA, has finally relented somewhat by offering Marabou more or less on a permanent basis (i.e., not seasonal). Though, the selection is quite limited. Swedish coffee company, Löfbergs Swedish Fika Coffee is now available in Canada! You can find it at Fortino’s and other stores. Check out their Canadian site for more info. Swedes take their coffee very seriously! Marabou Salt Licorice (Saltlakrits) 200 g chocolate bars and other varieties were spotted at Starsky’s in Missisauga (closer to Oakville)! Though I have not acquired the taste for it, Swedes go nuts over saltlakrits! Ick. 🙂 See my post about Saltlakrits here. About $7 a bar. Easter is around the corner! Here’s a tip to make an authentic Swedish Easter. You’ve got to try Janssons Frestelse (Jansson’s Temptation (English recipe here), a creamy and delightful potato-anchovy casserole), which is essential on the Swedish Easter Table (Påskbord) along with the ubiquitous meatballs. I got a great tip from a Swedish IKEA Saleswoman to substitute IKEA’s brand of Matjes Sill (Matjes herring) at the IKEA Swedish Food Market for Abba Grebbestads Ansjovis Original sprats found in this dish. I taste-tested this because I couldn’t find Abba in San Diego where I was last Christmas. It tasted really nice! Now I don’t have to hunt down Swedish Ansjovis when in a Swedish food-deprived city (P.S. Don’t substitute with the Italian anchovies, the one used on Caesar salad, it’s not the same flavor). By the way the Easter Table and Christmas Table (Julbord) are basically the same, but with the addition of many egg dishes and feathery decor. Try this recipe in English, but chop up your herring or sprats in small pieces before layering the dish. Viking Bakery (the Icelandic bakery) closed permanently. IKEA has been selling a few Swedish brands such as Marabou Chocolate, Kalles Kaviar and Abba Grebbestad Ansjovis. A Romanian grocery store, ABC Euro Delicatessen in Scarborough carries some Swedish products. Soon, this location will be accessible by subway! Beaches Bakeshop and Cafe, Toronto’s one and only Swedish cafe, has closed permanently July 31, 2018. Unfortunately, another Scandinavian food establishment bit the dust. Karelia Kitchen has closed earlier this year in April 2018. On the positive side, the Danish restaurant (The Danish Place) near Guelph has been renovated and the menu has been updated to align with more of a modern and chic decor and standard. Filmjölk is now being made in Canada as Nutrinor’s Fermented Nordic Milk! I have only seen this brand at McEwan’s, but this is astonishing considering it is nearly impossible to find outside of Sweden. Looking for creme fraiche? 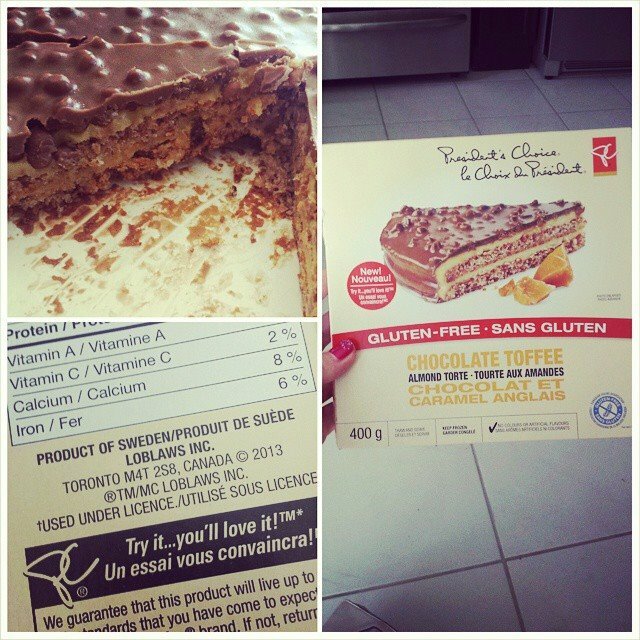 It’s sold in Sobey’s and Longo’s (and I’m sure in more places) from Liberte. Order candy, snacks, cookies and snus DIRECTLY from Sweden online at King of Snus. Found an equivalent to my absolute favorite Swedish sausage in the world – ONSALAKORV, which tastes nearly like this Barilo’s Jewish Beef Salami! JOY!! I found this at Yummy, but I’m sure you can find it at most Jewish stores like Nortown or somewhere in Forest Hills. The Cändy Bar candy shop has closed their retail location but has kept the online business open for ordering. Scarborough (East of Toronto) and will soon be accessible by subway/Eglinton LRT! This is a Romanian store and delicatessen that offers a few Swedish products like Kalles Kaviar tubes, Klädesholmen böckling pastej (smoked fish paste), Abba fiskbullar (fish balls), Abba Grebbestads Ansjovis fileer (herring sprats), Felix lingonberry jam, Annas pepparkakor (ginger snaps) and stenbitsrom (lumpfish caviar). They also have a nice selection of liver sausage, salt pickles (saltgurka) and ready-made soups/Eastern European food. This is a primarily Jewish meat market and sells specialized cuts of meat and some European imported foods. You can find Prinskorv (cocktail wieners, unsmoked) and all kinds of sausages/wieners/meat products. The sausages here taste so much better than the ones you find at the normal grocery. This is a primarily Eastern European/Russian grocery store, but carry a lot of Scandinavian/Nordic products due to the similar climate and close proximity of the Baltic countries and Russia. It’s one of our favorite places to shop as they have a lot of delicious Russian ready-made foods, such as baked salmon, chicken kiev, stroganoff and dozens of delicious soups on the cheap (see freezer section!). They have an interesting selection of cheeses and deli meats (charkvaror). It’s not to be missed! What You’ll Find: (Berries are seasonal, so variety changes) frozen lingonberries (lingon), seabuckthorn berries (havtorn), rosehips (nypon), WILD European blueberries or what’s called “bilberries” (blåbär, the kind that really stain), raspberries (hallon) and WILD strawberries (smultrön), headcheese (presssylt), vanilla sugar (vanilljin socker), flavored cottage cheeses/cream cheese similar to Keso in Sweden, Danish and Norwegian cheeses, frozen Baker’s yeast (färskjäst), smoked fish, Kalles kaviar in a tube, bulk caviar (both the inexpensive and deathly expensive types), Abba and Klädesholmen herring (sill) and salted herring to make your own pickled herring. Too lazy to make your own? They also have lingonberry jam and all sorts of other jams/jellies. For an authentic Swedish Christmas table (julbord), you will also find cocktail sausages (Prinskorv) and Abba anchovies or anchovy-spiced sprats to make the famous Jansson’s Temptation (Janssons Frestelse). This is a German grocery store, delicatessen and cafe that serves scrumptious schnizels and all kinds of “***wursts”. They have strudels, huge loaves of rye bread (the size of 2-year old child, I kid you not!) and all kinds of meat pies that are very Canadian and probably German? This is a primarily Polish grocery store that specializes in what they do best, deli meats (charkvaror)! Also, if you’re seeking special parts of the pig or cow, this is the place for you. Looking for pig’s blood to make blood pudding? Their meats are very affordable and they sell parts of the animal that would make Canadians puke :-). You can also go to the many specialized butchers around town, but this place is a lot easier on the pocket book, as ethnic grocery stores tend to be cheaper. What You’ll Find: Meat, animal parts, blood (only have this sometimes, you need to call and check). Eww…. but yum, once it’s cooked. 🙂 Great if you’re interested in cooking liver pate (leverpastej) and blood pudding (blodpudding). They also sell all kinds of sausages, deli meat, smoked fish (but VERY salty!!! ), herring (sill), crispbread, cheese, jams (such as Felix lingonberry), European candy and light (colored, not diet) sugar-beet syrup (ljus brödsirap). What You’ll Find: Salted, un-smoked ham (called Green ham), made to order. Please call at least 7 days in advance to reserve your holiday ham (julskinka). They are specialized in South African groceries and meats, but will do made to order and have done many Swedish/Norwegian style hams for the Nordic folks! What You’ll Find: Salted, un-smoked ham, made to order. Please call at least 7 days in advance to reserve your holiday ham (julskinka). What You’ll Find: Prince sausages and salted, un-smoked ham, made to order. Please call at least 7 days in advance to reserve your holiday ham (julskinka). Multiple locations in Toronto. See their website. What You’ll Find: Prince sausages and salted, un-smoked ham, made to order. Please call at least 7 days in advance to reserve your holiday ham (julskinka). They also a great selection of sausages and organic produce and meat! They are the main importers, if not the ONLY importers of Swedish and other Scandinavian products in Canada. Originally Finnish, they sell primarily Finnish goods but have now expanded to sell Swedish goods. They sell both to the public and to businesses. Among their products are Marabou, Cloetta and Fazer chocolates and candies, Abba seafood, crispbreads and mustards. If you order through them, be prepared to pick up goods from an office style building at this location. Now in Union Station and coming to Eaton Centre! In Oakville, this truly authentic Danish bakeshop owned and baked by Danes has the most delightful “danishes” (wienerbröd). butter cookies, rum balls and rum rolls (similar to Punschrullar and Dammsugare, but made with rum liquor) and even Swedish almond tarts (mazariner). Even though this place is Danish, Swedes have very similar type pastries, but I believe the Danes are the masters of wienerbröd. If you’ve ever bitten into one of those flaky, crispy and buttery danishes, you’ll understand what I mean. They just expanded their store hours to the public on the weekdays, as they used to only sell to the public on the weekends and wholesale during the week. A very modest little bakery near the Pape and Danforth area which sell the most delicious pastries on the cheap! They have everything from Danish (wienerbröd), marzipan rolls (similar to Dammsugare or Punschrulle), mazariner (almond tarts), sugar cookies, tosca-style pastries and many other kinds of goodies for the sweet tooth in you! This bakery started a long time ago, so the current owners are probably 2nd generation Danes, but luckily they kept the 1st generation prices. What You’ll Find: They sell some Danish products on the side of the bakery such as Dansukker pärlsocker (pearl sugar bits), bread spices and gelatin, but also some Swedish stuff like Marabou chocolate, Abba herring products and Läkerol! Also available are ready-made almond paste (marzipan) sold in half and whole kilo prices, as well as a Danish-style rye bread (unsweet, which is different from Swedish rye bread). They serve some Swedish pastries, like the yummy Swedish cinnamon bun (flavored with cardemom) and some Swedish grocery items for sale. They don’t really sell much Swedish food, but the owner is Swedish. During special times of the year, she offers Semlor (Swedish cream bun) and saffron buns (Christmas time). Unit 2, 350 Davis Dr. This company used to own a Finnish deli and store in the Leaside area of Toronto, but have since switched business models since their store burned down. This store has a deli, bakery and grocery section and is the 2nd location after the fire in Leaside. Carries all of the Viking Foods products and fresh-baked Finnish goods. This place is beautiful, but out in the middle of nowhere. This combination restaurant and retirement community is in a tiny village area near Guelph, about 1 hour out of Toronto. This is the closest thing to a Scandinavian restaurant in the Toronto area and they serve open-faced sandwiches, meatballs and potatoes and several kinds of Danish pastries. But the number one draw, I think, is the selection of Danish beer and aquavit, which is not easy to find around town. We found the food quite delicious and the restaurant has a pleasant atmosphere. It’s a nice drive in the summer time, and there’s an outdoor area if you want to take a walk, as the area looks very Swedish. Some of the Swedish groups rent out the outdoor area for mid-summer activities. Update: Owners of the old Danish restaurant have been bought out by the children and renovated to a modern and chic standard. They’ve updated their menu, and it looks simply divine! Check their Facebook link above for more information. A wonderful, new cafe that opened December 2012 serving smoked fish and meats, open-faced sandwiches and housemade pastries by experienced chefs who love Nordic cooking, and it shows! Try their smoked platter, it is a layering of smoked and pickled items with crispbreads that are a nice mix of Scandinavian flavors. Though they don’t specify the country, they definitely have more of a Danish edge. They also serve Danish aquavit, ciders, and will get more Scandinavian liquor if they can get it. You can also order smoked fish and meat to go. A nice addition to the very underrepresented Scandinavian food scene in Toronto! Fika means “to take a break, usually with coffee and sweet” and is owned by a Canadian who spent some time in Sweden and was inspired to open this cafe. I have not personally tried this place, but by the looks of the menu, it seems to have quite simple fare for coffee/tea, but not technically Swedish food. Sometimes they have Semlor (a Swedish cream and marzipan-filled bun served on Shrove Tuesday to Easter), but I don’t know who makes them. Cheese is a highly regulated commodity in Canada, so Swedish cheese is both difficult to find AND highly expensive. However, some specialty cheese shops, like Alex Farm, carry very high-end organic farm cheese from Almnäs Bruk farm, such as Tegel and Anno 1225. These special cheeses were made back in the medieval ages in Sweden, meant for those very special occasions! This New Foundland company carries Cloudberry Jam (under the name Bakeapple jam, in Swedish, Hjortronsylt), wild European blueberry jam and Lingonberry jam (under the name Partridgeberry jam, in Swedish lingonsylt). New Foundland is like a little Scandinavia where you can find many of the same type of berries and berry picking culture, as the climate and landscape are very similar to Sweden. They even have cloudberry and lingonberry drinks (saft)! I’m sure when the vikings landed in this area so long ago, they felt right at home. Havarti cheese, made in Canada by Dofino which is owned by Arla, tastes a lot like Hushållsost! Falukorv can be substituted with Lyoner sausage (Freybe) or Lioner sausage (Piller’s) right here in Canada. It tastes VERY similar and the texture/consistency is spot on. You can find this sausage at Real Canadian, Loblaws, Sobeys and near the deli counter at other chain stores. I also found a brand of Lyoner sausage in the U.S. that you can try to locate or order online! Here is the link to Bavaria Lyoner Sausage. Swedish-style rye bread like Kavring or Rågbröd? I found a near equivalent of Swedish rye bread (tastes similar to kavring and råglimpa) at the Russian store. It is called Belarusian bread from Belarus, a country formerly in the U.S.S.R. I checked out the ingredients and it’s made with rye, sugar and sourdough starter, so it has a slightly sweet and sour flavor with NO CARAWAY/CUMIN flavor, which is important, because most rye bread around Canada uses that spice and my husband doesn’t like it. I use Ricotta cheese (as a substitute for Kesella in Sweden) and a bit more sugar in my saffron buns, and they totally rock! Again, the mild cheese flavor of ricotta cheese and consistency match that of Kesella (which many Swedes use to make their saffron buns chewy and moist). Kesella is actually Quark cheese, which SOMETIMES can be found at the grocery, but you can find it at the Russian grocery as “cottage cheese” near the cheese section. However, ricotta is easily found at any grocery store in the city, so it’s better and just as good to get that. Swedish “Bread Syrup” (Ljus or Brödsirap) is a sweet syrup derived from sugar found in beets. There’s no flavor difference, but the consistency and sweetness level can throw the recipe off if using some other substitute. We have found a suitable syrup which gives the same result and flavor. Use Lyle’s Golden Syrup (or treacle) instead of light bread syrup and molasses (or dark/black treacle) to make the dark bread syrup. Lyle’s Golden Syrup is a pale treacle derived from cane sugar or beets and can be a direct substitution with ljus sirap. Lyle’s Golden Syrup can be found at most grocery stores, Bulk Barn and ordered online. The ratio for making dark bread syrup (mörk sirap) can range from 1:3 to 1:1, using parts of Lyle’s Golden Syrup and Molasses or Black Treacle. For example, 2 dl of mörk sirap can be 1 dl Golden Syrup and 1 dl Molasses or 1.5 dl Golden Syrup and .5 dl Molasses for a less dark syrup and less strong bitter after note. Molasses is very strong tasting with a woody taste, often used to “color” bread darker, so you will have to do some of your own experiments to find out what ratio you like best! You need to be a licensed hunter to get moose, since moose is not allowed to be sold commercially. But if you can settle for elk (Wapitihjort), horse or venison-deer meat (råddjur), then you can find it in several meat specialty shops like White House Meats, Cumbraes and others. Saffron is an expensive herb/part of a flower used to color and flavor the typical yellow saffron buns (Swedish Lussekatter) and desserts served during Christmas, especially on St. Lucia day. You can find this herb at Whole Foods (by the spices) or at big stores that sell ethnic groceries. 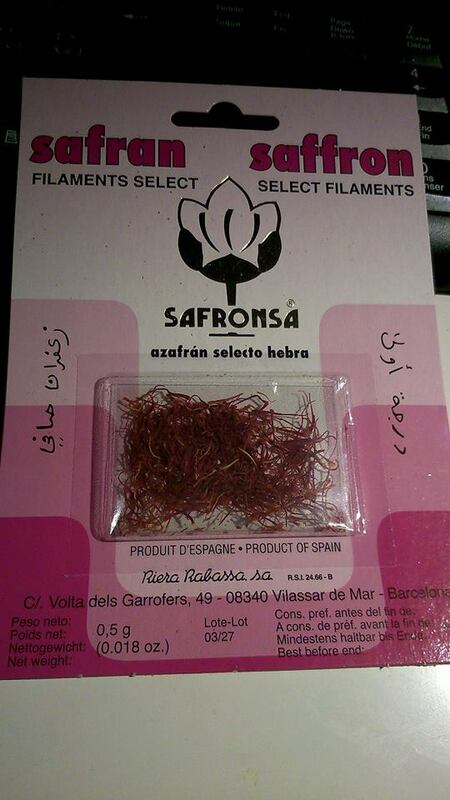 Iranian/Persian, Moroccan and Spanish people use saffron a lot in their cooking and it usually comes in threads or powder form. Note, you may have to get someone to help you find it as it is usually in a small capsule in paper packaging. Craving blood pudding? You can find pig’s blood (grisblod) at Asian grocery stores, where both Chinese and Filipinos use pig’s blood in some of their dishes. Usually, it is found in the frozen foods section. There are many Asian grocery stores in Toronto, thanks to the vast Chinese population. Try Ocean’s or T & T, as they are 2 of the biggest Asian groceries around. Also, I just heard that you can find pig’s blood at some specialty butchers, like Cumbrae’s as some British dishes use it to make blood sausages. These lovely mushrooms are prized in Sweden and are not easy to find in Toronto. You can go to Queen’s land and pick them yourself, but you got to know where they are. Your best bet is to find them at the various farmer’s markets around Toronto during the mushroom season. St. Lawrence Market might be a good place to start, as gourmet chefs shop there and probably request those more than your average Joe, since they are a bit on the expensive side! I have also seen Chantarelles at Whole Foods Market on a seasonal basis. I’m afraid you’ll have to go to the many specialty tea shops around town, like David’s Tea. It’s not commonly found in grocery stores, as I have explained in this post. At the tea shops, it’s very expensive (like double the price! ), so you may want to stock up if you go to Sweden. I found Gevalia coffee in Tassimo coffee packets and you can either pick it up at Canadian Tire or order online directly from Tassimo Canada’s website. Of course, you have to have the Tassimo coffee brewer until I find where you can get just the coffee packages in Toronto! Ground Gevalia coffee packages have recently been available in the U.S. If you’re so inclined, you can cross the border in Seattle or Buffalo and buy it there! Update: You are now able to buy through Amazon.ca! It is sometimes available at Summerhill Market. Made by an Icelandic company called Siggy’s, it is a bit pricey at 6.99 a bottle. You can also make your own Filmjölk if you can get a friend in the U.S. to mail order it and then ship it to you as a gift, as you can make an unlimited supply of homemade Filmjölk for way cheaper. Otherwise, you can actually substitute Filmjölk with Buttermilk in all baking-cooking recipes. Update: A company in Quebec is now making an equivalent called Nutrinor Fermented Nordic Milk which uses the same bacteria as filmjölk. I love a good liver spread, and we found an excellent comparable one here in Toronto by Brandt Meats. It is a spreadable one in plastic casing that is found in most grocery stores. The best one we found was the Liver Sausage – Course, which is very similar to flavor and texture of Arboga leverpastej. Try it and comment if you agree that it’s delish! They sell it in buckets of salt water at Yummy Market in North York. They are crunchy with a salty finish, and are comparable to the ones in Sweden! Löjrom (Golden Whitefish Caviar)? Stenbitsrom (Lumpfish Caviar)? Creme fraiche is used a lot in Swedish cooking and with various Spring courses. Here in Canada, creme fraiche is a luxury, gourmet item and costs appropriately so. It is much cheaper and tastier to make your own. Also, creme fraiche doesn’t curdle or break when cooking. Follow this recipe and video to make your own creme fraiche and you’ll never get store-bought again! Bread and Butter pickles are a good substitute and are sweet and sour, unlike the traditional North American-style pickles served in hamburgers. On sandwiches, especially on liver pate or roast beef sandwiches, many Swedes eat the Bread and Butter pickle type with this type of sandwich, as the sweetness really complements the heavy meaty taste. I know it is much nicer to make your own pickles, but “when in a pickle” try these pickles!!! 🙂 They are found in almost all grocery stores in Canada, and the best ones are “all natural”. Bick’s pickles also carry a Bread and Butter Pickle variety. A fellow follower found a place to find General snus, both in loose and portioned packs in both regular and flavored varieties. However, it is located in Oshawa, a suburb east of Toronto. 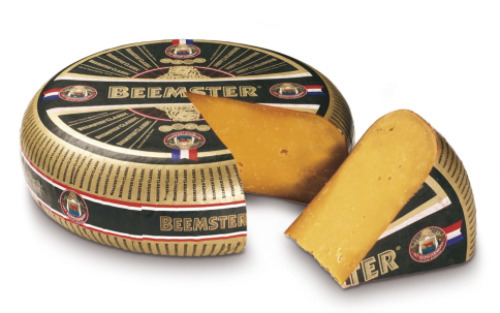 Swedish-style, whole-grain sweet mustard like Graveleijs Senap? I just found a really good one at Sobey’s that is German called Hengstenberg Senf. It is really great on sandwiches and adds a sweet undertone to meat and cheese. Rose Hips to Make Nyponsoppa? If you must have Swedish chocolate, Marabou is now available in many places in Toronto, like Hansen Danish Pastry thanks to Viking Imports. You can even buy directly from Viking in Toronto, since they have started importing it to Canada since last year. 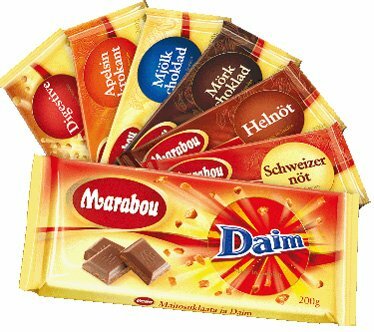 If you want Marabou in your part of Canada, just talk to your local specialty grocery store and tell them to contact Viking Imports, as they sell wholesale to other businesses. Right now, they only have the regular chocolate bars. IKEA is currently selling Marabou more or less on a permanent basis, although quite a limited selection. This toffee cake is actually MADE IN SWEDEN!!! Since it’s a President’s Choice label, it can be found at Loblaw’s, Real Canadian and ValuMart grocery stores. Please call your store first, since it may not be in stock in your particular store. Bulk Nordic candies or lösgodis? Swedes, both children and adults alike, take their candy seriously. Thanks to Len from the Swedish Canadian Chamber of Commerce here in Toronto, he decided to bring Swedish-Nordic bulk candy made with all-natural, non-GMO ingredients all the way to the GTA (Greater Toronto Area). They even have dreamy Marabou, Daim and Fazer (think Geisha) chocolates for sale! He named it appropriately, Cändybar. Check out their Facebook page for more information! UPDATE: You can only order online, as the retail location has closed down permanently. In 2015, IKEA has decided to try selling Swedish bulk candy in their stores. Absolutely excellent post Myleen: very valuable and comprehensive!! Thank you – keep on writing. Thanks Mikael and hope you find all the stuff you need here in Toronto. Makes living here a lot easier! Myleen, Rekorderlig Cider på LCBO – finns i både skogsbärssmak & fläder! Yum, that is great you found this! I miss Swedish cider! Tip! When I lived in Toronto I bought fresh yeast at “Kingsway Meat Products & Deli” in Bloor West village close to Jane station. Thanks for including my cafe’, Beaches Bakeshop & Cafe’! We sell fresh yeast as well. The SEMLA season starts on Tuesday january 15! Semlor will be available every Tuesday and Saturday until easter or any day as long as you call and preorder! I bake Kanelbullar every day and we carry dammsugare, mazariner, chokladbollar, mandel biskvier mm. Allt hembakat såklart! Smörgås tårtor can be special ordered as well! Great! Will blog about Semlor season soon, so I will give you a mention! Of course, Anna, you’re the only Swedish place in town! Thanks for being “in existence”. Hope you sell tons of semlor and cinnamon buns!!! Två saker: vad kan jag köpa: Läkerol och O’boy ? Tyvärr finns Oboy inte i Toronto men något liknande kan du säkert hitta (hot chocolate mix)… Jag tror att du kan köpa Läkerol på Viking Foods men annars kan du köpa Läkerol och Oboy på SWEAs julmarknaden i november. De köper in matvaror och gods från Sverige, så passar på! Many Swedish name brand foods can be had at the SWEA Swedish Christmas market that takes place in November at the Harbourfront Centre. Date and time will be posted in the future on the Event Listing page. I actually found Lākerol at Hansen’s Danish bakery on Pape St. Among other things like Abba and Marabou chocolate! Jag tycker att din hemsida är jättebra för oss Svenskar. Jag har hittat en cigarraffär som säljer Svensk Snus in Oshawa (öster om Toronto). De säljer General, både lös och portion, original eller smaksatt. 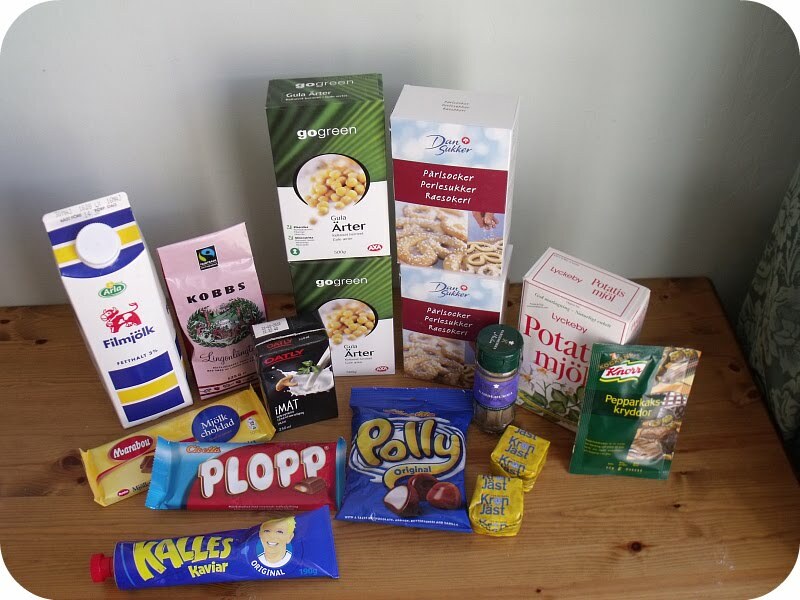 Hi Myleen, you can order all kinds of Swedish food online at swedishfoodshop.com. I’ve order from this website many times and it’s great. Thanks Lisa. Do you live in Canada? Are the shipping charges/import duty very expensive? Glad I found this! I am of Danish heritage, but have friends in Stockholm. I was spoiled off of liverpaste here by the ICA stuff. I agree that Brandt is the closest thing to it, everything else has too many spices, tastes too German. The closest pickles I could find are the Strub’s bread and butter that you find in the Kosher section. The only thing I haven’t found a suitable replacement for yet is the Danish style rye bread you can get in Sweden eg from pagen.se (site was down when I tried). Hi Majken, sorry for the late reply! Have you tried the Danish bakeries? Both of them serve unsweetened rye bread. 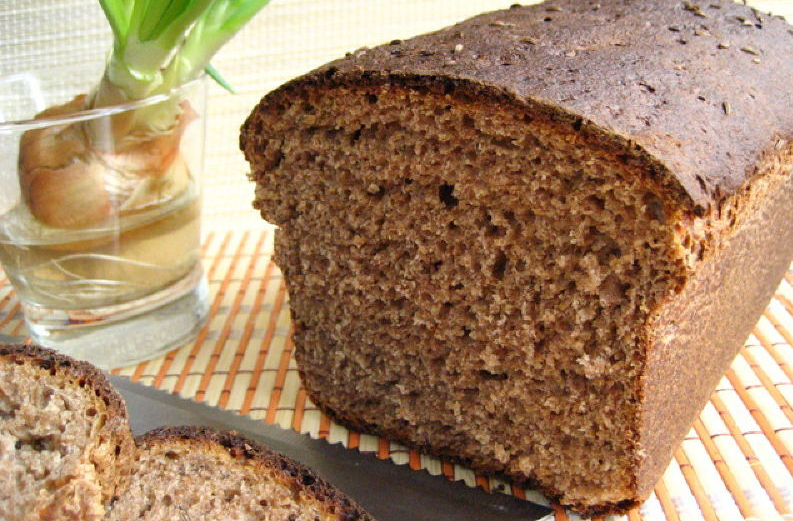 The Swedish style (sweetened rye bread) cannot be found anywhere! We usually make our own rye bread and it tastes delicious like Skogaholms Delikatess råg limpa. You will probably have to make your own too, I’m afraid. No problem, it’s an old post! Well that’s the thing, in Sweden, the Danish style ryebread is sweetened, and it’s darker, too. The site is working now! Here is the Pagen version – http://www.pagen.se/matbrod/morka-skivade-brod/pagen-ragbrod/ – which lists the ingredients. Wouldn’t it be funny if we mean the same bread? So far what I’ve been able to find is German or Jewish style rye-bread, more like the stuff you’d find in a deli. I’m not sure why it’s called Danish style in Sweden, perhaps it went out of fashion in Denmark after it got its name? I can find a lot of Swedish food in Canada. But Arboga leverpstej kan jag inte hitta. Try Brandt or Pillers liver sausage in plastic casing near the coldcut meats/cheeses. They taste similar! Highland Farms (Mississauga & Scarborough) sells laxpastej and Klädesholmen sill.